Couple goals all in white. We see a beautiful couple wearing all white outfits. Jennifer Lopez is wearing a white lace midi dress completed with oversized sunglasses, ankle strap sandals, and a striped tote bag. Check out this cool summer chic boat trip look for spending your time in Positano, Italy. A cream blush top with spaghetti straps is teamed with silver sequined shorts. Complete this look by adding mirrored sunglasses. Make a wow impact on the streets wearing this stunning summer look. We see a white corset crop top with puff sleeves paired with knee-ripped skinny jeans and blush sandals. Complete this style by adding blush handbag. An ideal OOTD for Italian ladies. Italian street style. Looking for a way to underline your individuality during your stay in Italy? Go for this bright orange sleeveless romper with an open back. Complete it with white Timberland boots. We see a beautiful strapless romper with flared sleeves in white-red print. It’s simple, relaxed and ideally suits young ladies. 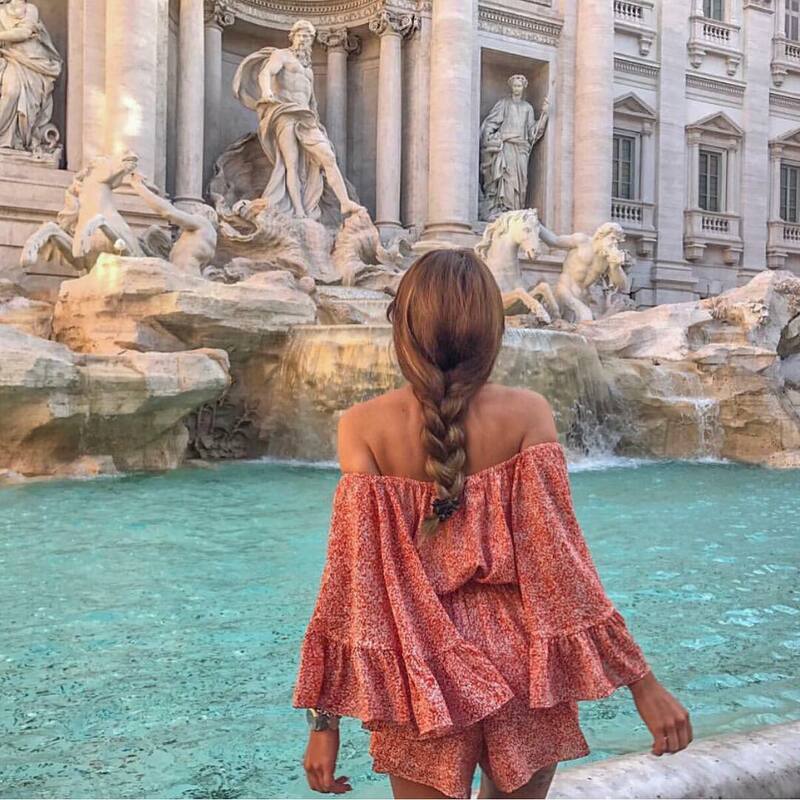 Wear it during your Rome vacay this Summer. La Bella Italia! You can’t go wrong with this black coordinated outfit idea. We see a lovely lady wearing a black crop top and wide-leg high-rise pants in black color during her stay in Venice, Italy. An ideal combination for spending time in Italy during Summer season months. Feeling protected. Check out this beautiful strapless red jumpsuit with wide-leg pants, it’s airy, light and ideally matches Summer vacation in Italy. You definitely should give it a try during your next Summer holiday. Beautiful dress outfit inspiration for your Summer trip to Venice. We see a classy one-shoulder slim maxi gown in white color. It’s a perfect choice for ladies who are going to visit a very special event. Stunning outfits for your next Milan trip. We see two outfit ideas for young ladies. One of them features a beige leather jacket worn over beige crop top teamed with slim cropped jogger pants and the other outfit consists of a white lace crop top and high-waist shiny silk wide-leg pants.